After two days of leaks and speculation, state employee union leaders and Gov. 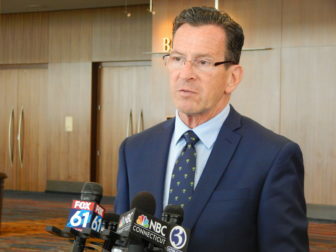 Dannel P. Malloy struck a tentative framework to recommend a $1.5 billion concessions framework to member bargaining units. The State Employees Bargaining Agent Coalition, comprised of representatives of all worker unions, voted to engage in formal discussions with the Malloy administration — a legal prerequisite to any tentative deal. The governor’s office announced the tentative framework Tuesday evening. Unions also began to notify their members Tuesday through posts on the bargaining units’ websites. And at least one union estimated concessions wouldn’t be voted upon until mid-July, about two weeks after the next fiscal year has begun. “We have voted to move forward with formal negotiations, based on an agreed-upon framework for providing job security and protecting benefits for members, while producing cost savings for taxpayers,” said Salvatore Luciano, executive director of Council 4 of the American Federation of State, County and Municipal Employees, one of the largest state employee unions. “This is about defending your rights to collective bargaining and maintaining our historic role as advocates for the American middle class in these uncertain times,” said Jan Hochadel, president of AFT Connecticut. The proposed framework reportedly would save the state $708 million next fiscal year and $845 million in 2018-19 — nearly matching the $1.57 billion, two-year savings target Malloy set in February. The plan would freeze wages for each of the next two fiscal years. Employees, most of whom are working this fiscal year under contracts that expired last June, also would forfeit any retroactive pay hike. Workers would be required to take three furlough days. The framework also would double pension contributions for most workers, create a hybrid pension/defined-contribution plan for future workers, increase health care co-payments and premiums, require active workers to contribute more toward their retirement health care benefit, and curtail health care benefits for existing retirees. Those last two provisions, though, remains a huge point of contention. While Malloy’s fellow Democrats in House and Senate leadership praised the deal, the top Republicans particularly were skeptical about whether the concessions’ value was sufficient to offset the five-year extension. Connecticut has one of the worst-funded public-sector retirement benefit programs in the nation, and some have argued the state should allow the contract to expire and then dramatically curtail benefits after that. Union leaders are expected to take several weeks to discuss the concessions plan with rank-and-file workers. The A&R union represents about 3,000 state accountants, and other fiscal and legal professionals.